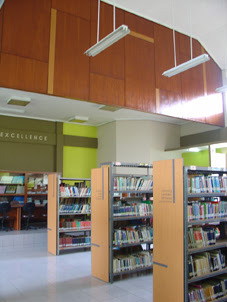 In 2005, we took several library renovation projects in our hands, mostly with similar aims of creating new atmosphere and adding newer facility inside the library that might help increase the visitor to the library. At that time, people would still look for another place to read and study rather than in a library, especially a campus library. 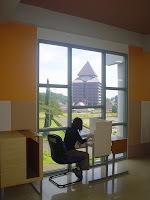 Our first library project was the Miriam Budiardjo Resource Center (MBRC) at FISIP UI, Depok. It's located on the 2 out of 3 storeys building, where the resources were kept as hardcopies, books and literatures. We created new layouts and vertical circulation inside the library, with an integrated concept of 'inside a womb'. The ambiance was set to be warm and condusive for people to get their information from the library. After the renovation, MBRC was visited almost four times the visitors before the renovation. As the students increase rapidly, now the MBRC would need more space upto four times the original area, and this has become our next project of extending the MBRC. Even when the resources have become more virtual, the need of new atmosphere is still adequate. Our second project was the renovation of 4 split levels FIB Library, the library with the most complete and variative collections in UI Depok. It has manuscripts, microfilms, ancient books, and collections from many culture accross Indonesia and even the world. We created new circulation, both for the visitors and the administrators/librarians, where they can reach each continuous floor more easily than they previously have. A concept of 'hypertext' was proposed in order to help them adjust with new layouts and circulations, especially the self-service exchanging of 'texts or resources'. Again, the new atmosphere for a library managed to increase the number of visitors, as well as the interest for browsing further. The next project was the renovation of 4 storeys FKM Library. In this project, we are faced with multiple storey large area with limited collections of books, and not so many furnitures. The key was to create more open circulation, focusing on the entrance (service counter and catalogues) and the comfortable reading and browsing areas. A touch of purple (represent the faculty identity) and soft pastel furnitures, have made this spacious library to have a sense of warmth and calm, especially in some reading spots where people can also enjoy the scenic view of PAUI building. 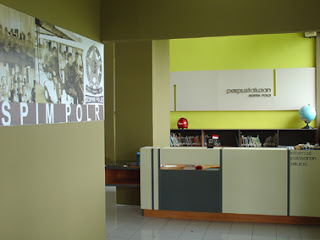 Recently, we have the opportunity to design the interior renovation of Sespim POLRI's Library in Lembang. Although quite sceptical at first, the project was then become more realistic over a very short period of time, and thus became interesting. Again, the goals are similar, and our method was unnecessarily new. The room is large in volume (high ceiling, wide range), the collections were plenty yet unvariative, and they need more convinient space to read. The formal and standard guidelines were then replaced by fresh and colorful look of furnitures and partitions, and lucky for us...they agreed. The new library for the high-ranked officers should reflect also their dynamic personality as well as the spirit of go international. Fresh colors walls and partitions, with a contrast from warm wood finished furnishing, have made this library the new icon for the spirit of reformation in POLRI. This design is a respond to the problem of housing typology that can put up the needs of homeowners properly and to provide qualities of a healthy house within the constrains of very limited space and funding. The house is located on Jalan Abdul Majid, Cipete,Jakarta, a rather dense residential area where houses were usually built by developers in various sizes with minimum site width of 6 meters. More often the houses’ backyard would eventually be built as an extension of the houses and resulting in dwellings with poor natural ventilation and lighting. This 6x22 meters existing site have to left 60 m2 open space at it’s front in regard to residences policy for the future main road development around Cipete. The main concept offered is how to increase the density of a house on a small site, and to enhance the quality of habitual spaces, as well to maintain good environmental quality in natural ventilation and lighting. Within a feasible area of 6x12m, the house is designed to be compact in its space program. We decide to divide the program by locating the private area, like master's and children’s bedroom on the upper level. While the semi public area containing dining room, kitchen/pantry, and family room are in the lower level. The client also requested for an extra bedroom for their visiting parents in the lower level, which might occupy most of the area. Thus, by using movable divider hidden inside the cabinet, we manage the existing family room to become an enclosed space when it is needed. We also manipulate the dining area by designing a folded table in wall that separate kitchen with the family room. The maid's room and service area are located in front of the house to let the maid give a constant look out of the house. An attic storage located beneath the roof, while an open green terrace is provided above the children’s bedroom to accommodate inhabitants’ outdoor activity and their needs of open space that was taken in the lower level. This design tries to maximize the usage of natural lighting and cross air ventilation. Using zincalume walls as the house’ skin accentuate the sense of lightness while maintain the less maintenance cost of the building. Although located in a narrow sided site, the design provides a perfect cross ventilation with the use of a small courtyard as a “chimney” in the center of the house which allows air to flow crossing the spaces and then channeled outside without reducing the inhabitants’ needs for spaces. 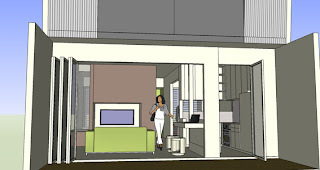 Overall, this design illustrates our concern in designing simple urban houses issues. The design may not only contribute to the development of a typology for small and affordable housing, but also initiate an effort to reduce urban sprawling. Furthermore, this design could stand out as a model of an appropriate and suitable dwelling in narrow sites scattered around the urbanJakarta. During the past couple of years, we find many of our clients asking the design procedures or process that they were not aware of. It made us feel obliged to share these procedures to you, at least in the way we usually do. Both, architecture and interior designs, should involve these steps in order to get a better outcome for you. Every design starts with conceptual sketches, ideas or drawings, that may presented up to 3 alternative designs. Thus we would need several preliminary data from you that help us to identify the context and visualize the project. As an initial idea, this step is very important for both sides, since every step ahead is taken in accordance to the agreed concept. Once agreed, we can then proceed with a contract and further design process. Therefore, this first phase may cost upto 15% of total design fees. The second phase is preliminary design, which will be presented in simple and undetailed measured drawings, and is made in accordance to local codes or regulations. In most cases, this preliminary drawings can be used for applying building permit to the government, bank's loan, etc. Since the process is considered to be a simple applied concept on drawings, this phase may only cost 10% of the total design fees. The third phase is design development, which may be the longest period of design that involves many discussions with detailed needs or taste. In the process, we also have to decide the engineering (structure, mechanical/electrical, and plumbing) functions to match the whole design concept. There will be many design revisions, a lot of sketches and details that need approvals from both parties, etc. The work load, including the design process and the paper works, may put this phase to cost 40% of the total design fees. The next phase is to apply all the design development process, discussions, and revisions into construction drawings, as well as the material specifications. Once the development design and construction drawings are settled, we can estimate the project feasibility through a cost estimation plan. This phase's outcome can be used to the contractors' bidding process, and even the construction process directly. These detailed construction documents will be charged upto 30% of the total design fees. The last phase of the design process is supervising the project construction regularly. We have a maximum of twice/month project visits that aims to assuring the construction process is matched and in accordance to the construction documents, as well as the architect's direction. However, we are not responsible for any on-site changes made by clients or contractors during the process. As our responsibility, this phase would cost 5% of the total design fees, that will be paid when the construction is completed.